Nothing quite like the scent of magic in the morning, although at the Wizard’s Academy, there’ll be none of that today, for not only has its owner gone missing, but every last teacher too! As such, it’s up to the students to figure out happened, hopefully bringing everyone back in the process. There’s just one problem: no one has a clue as to what their spells do! Recipe for disaster or a good time? Probably a bit of both. If history is any indication, experimenting with magic is a terrible idea, and yet, you’ll have to do a fair bit of just that to progress through this cooperative Tabletop Simulator addition. Oh and try not to get yourself killed in the process, eh? No really. You’d be surprised as to just how common that is with such clueless wizards involved. On top of trying to figure out what does what to who and where (and so on), there’ll also be various traps, enemies and disasters to deal with. Because easy mode is for, well, other board games. I suppose. Anyway, last but not least, how about a randomly picked objective every now and then? Sounds good? Great, because you’re in for plenty of those in the form of ‘scenarios’. Good luck engaging your own spellbook in mortal combat. Note: while every player needs a copy of Tabletop Simulator to play Wizard’s Academy, only the host needs the DLC. 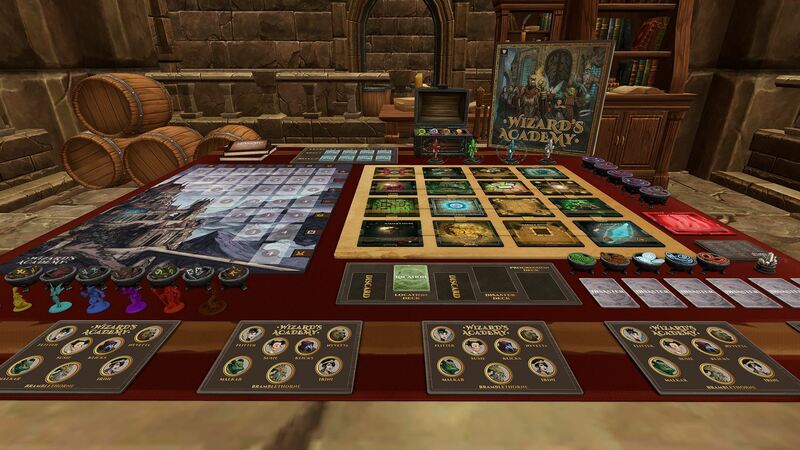 Tabletop Simulator – Wizard’s Academy is available from Steam, at $7.99.